Martell VSOP Medaillon Cognac is a popular Brandy and Cognac available from Waitrose Cellar in 70cl to buy online. Visit Waitrose Cellar for the best price for 70cl of Martell VSOP Medaillon Cognac or compare prices on our other Brandy and Cognac products. Since 1715, Jean Martell and his successors have established an indepndent spirit, a creative flair and a passion for fine quality in th cognac that bears his name. Martell VSOP is the connoisseurs choice. Complex yet smooth, it is made from carefully and harmoniously blended mature ''eaux-de-vie'' from the four finest growth areas of the cognac region. Where to buy Martell VSOP Medaillon Cognac ? Martell VSOP Medaillon Cognac Supermarkets & Stockists. 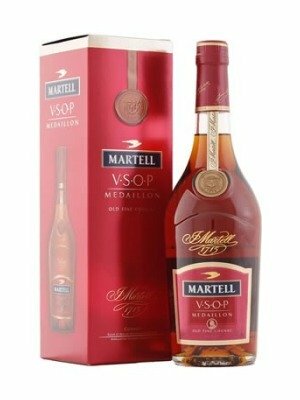 You can buy Martell VSOP Medaillon Cognac online in most retailers and find it in the Brandy and Cognac aisle in supermarkets but we found the best deals online for Martell VSOP Medaillon Cognac in Waitrose Cellar, DrinkSupermarket.com, and others. Compare the current price of Martell VSOP Medaillon Cognac in 70cl size in the table of offers below. Simply click on the button to order Martell VSOP Medaillon Cognac online now.